On Sunday morning, the Gloucester High School track team traveled to the Reggie Lewis Center in Roxbury for the most competitive meet of the year. All of the teams from the North Eastern Conference competed to see the best of the best. The team had great individual performances with some athletes making it onto the podium with top level performances. 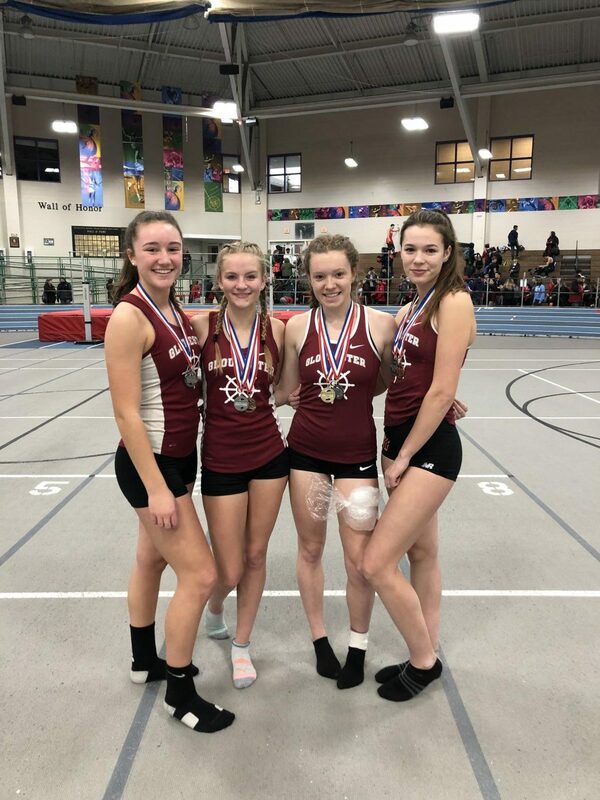 Two girls relay teams placed; 2nd for Sedona Gillard, Lila Olson, Leah Rudolph, and Rumi Thomas in the 4x400m relay, and 6th for Rebecca Dowd, Graci O’Toole, Lauren Wood, and Ella Young in the 4x200m. The girls team also had four individual athletes who placed in their own events. In the long jump, Rebecca Dowd jumped 15’ 4.5’’ which brought her to 5th in conference. Elizabeth Kuhns high jumped a height of 4’ 10’’ to get 6th place. Kuhns also ran a personal best time in the 55 meter hurdles and placed 4th with a time of 9.72 seconds. Sophomore Rumi Thomas placed 3rd and ran a personal best of 44.8 seconds in the 300 meter race. Leah Rudolph, who recently committed to attend UMass Lowell next fall, won the 600m title with a time of 1:39 for the 3rd time. The girls team placed 4th overall with 33 points. Even those who didn’t place were successful. Sedona Gillard and Serene Desisto both had personal best performances with Gillard running a 300m time of 45.39 and with Desisto throwing the shot put 24’ 8’’. The boys also had a successful day at Reggie Lewis with many of their young athletes performing at their best level, and eight personal records. Kai DeGuzman placed 6th in the 55 meter hurdles with a time of 8.92, which was a PR. The boys 4x800m relay, competing with freshman Kyle Clifford, Andrew Coelho, Tommy Elliott, and Daniel Hafey, also placed 6th. The boys side came away with a couple victories, but it was their young talent that made Sunday a success for the boys. Four freshmen and two sophomores ran their personal bests. Daniel Hafey and Kyle Clifford both ran the 1000m with personal bests of 3:04 and 3:05 minutes. Andrew Coelho and Nick Poulin both ran a new best time in the mile with Coelho running a sub five minute mile with a time of 4:58, and Poulin running a 5:40 PR. For the upperclassmen, senior Max Boucher, ran his 300m with a new best time of 40.15 seconds and junior, Andrew Topouzoglou, also ran a personal best time in the 300m with a time of 40.86. The next meet is on February 10th, and the State meet is on February 17th. Both will be held at Reggie Lewis Center.